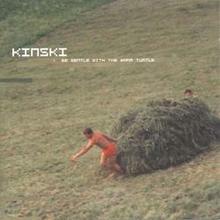 I just saw one of the guys in Kinski at a record store so I thought I'd write about them. Kinski is a Seattle band that's been around for several years creating nice, loud music in what I suppose I'd call a psych-rock vein. It should be noted, though, that I consider them to have gone downhill since the moment I started listening to them, their first album (this) being their best, and the subsequent albums decreasing in quality. I say this, but they are also kind of a live band, good at improvisation and just generally making delightful noise. I got to see them jam with Acid Mothers Temple about a year and a half ago and it was unholy. This album is great, solid all the way through but in my opinion stronger at the beginning. The opening trio of "Spacelaunch for Frenchie," "New India," and "Newport" is pretty much solid gold. The warm, droning opener gently initiates you into their world, before crushing you with the enormous "New India," which sounds bigger than an elephant storm. This second song starts out pretty loud, then it gets louder, then louder, and every time you think "how could they possibly be adding more guitars? Are there this many guitars in the world?" and it's good, too! "Newport" has a more songy sound, mainly because of the powerful drumming and the presence of a few lyrics. It has some really raw sounding guitar parts, and manages to keep the steam going on full for its duration. "One Ear in the Sun" sounds like a Yume Bitsu B-side (which is good), and "That Helmut Poe Kid's Weird" is like newer Mogwai, though it predates Rock Action, its closest reference. Anyway, it's a great album, I find as I listen to it again now that it's better than I remember even. You'd do well to pick this up right away, I consider it a classic album in instrumental psych or post-rock, along with Do Make Say Think's Goodbye Enemy Airship, the Landlord Is Dead and Explosions In The Sky's first LP. just generally making delightful noise.